[SLAVERY. MOUNT VERNON. WEST FORD]. MARY BOWLES [ARMISTEAD] SELDEN. Autograph Letter Signed, to John Augustine Washington III, hand delivered by West Ford; JOHN AUGUSTINE WASHINGTON III. Autograph List of Slaves. Single folio leaf with autograph address on verso. [Alexandria, Virginia], . I am very sorry to be unable to render you the service you require. I have a very fine stacker but he is hired by the year to Mr Young, as I did not expect to have employment enough for him at Mt Ida. Another year if you wish it you can have him I receive very small wages for him and as a stacker I have never known any one equal to him. I am very sorry to hear that Nelly is sick. I hope she will be well enough to come up and meet the bridal party on thursday. I received a letter from Eliza to day in which she says they will be at Mt Ida that day but will bring no company with them. It will give great pleasure to them and to me if Mrs Washington, Nelly and yourself will come up on that day. Mrs Lippitt will have a room ready for any of the party that will favour her with their company she must by no means be left behind. Farmers in mid-nineteenth-century Virginia typically planted winter wheat in September and October and harvested it in the following June. After wheat had been cut, a stacker tied the wheat into bundles and piled the bundles in shocks to dry in the field. After the shocks dried, they would be stored in a barn or carefully built stack capped with grass to shed the rain, until threshing time. Even after Cyrus McCormick developed his mechanical grain reaper in the 1830s, men needed to follow the machine to bundle and stack the wheat. Building a good stack was an important skill, and those workers, free or enslaved, who knew how to do so, were very valuable at harvest time. Mary Bowles Armistead Alexander Selden (1783-1846) was born in Hanover, Virginia. She married Charles Alexander Jr. (1772-1812), with whom she had five children, including Louisa Elizabeth Fontaine Alexander (1802-1827). After her first husband’s death, she married Dr. Wilson Cary Selden (1761-1835). She was his third wife, and they had three children. By his first wife, Dr. Selden was the father of Wilson Cary Selden Jr. (1796-1843). In 1822, Wilson Cary Selden Jr. married Louisa Elizabeth Fontaine Alexander, and they became the parents of Eleanor Love Selden (1824-1860), who married John A. Washington III. Thus, Mary Bowles Selden was both the grandmother and step-grandmother of Eleanor (Nelly) Washington. 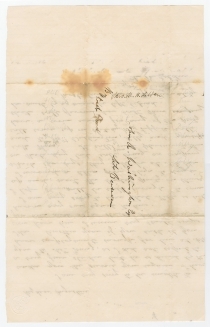 At the time she wrote this letter, she was living at Mount Ida, a 6,000-acre plantation that stretched along two miles of the Potomac River north of Alexandria, Virginia, and fewer than ten miles from Mount Vernon. Her first husband built the neoclassical mansion of Mount Ida in 1808. John Augustine Washington III (1821-1861) was born in Blakeley, (West) Virginia, the son of John Augustine Washington II and Jane Charlotte Blackburn Washington, and graduated from the University of Virginia in 1840. His father inherited George Washington’s Mount Vernon estate in 1829, but it passed to his wife at his death in 1832. In 1841, Augustine Washington proposed to manage Mount Vernon for his mother. When she died in 1855, the plantation passed to him. In 1858, after offering the property to both the federal government and to the State of Virginia, he sold 200 acres of the Mount Vernon estate, including the mansion, outbuildings, and family tomb, to the Mount Vernon Ladies’ Association for $200,000. Washington married Eleanor (Nelly) Love Selden (1824-1860) in 1843, and they had seven children. In 1860, he owned 22 slaves. In 1861, Washington joined the Confederate Army as a lieutenant colonel and served as an aide-de-camp to General Robert E. Lee. He was killed while conducting reconnaissance at the Battle of Cheat Mountain in September 1861. West Ford (ca. 1784-1863) was born on the Bushfield Plantation in Westmoreland County, Virginia, to an enslaved woman owned by George Washington’s brother John Augustine Washington. When George Washington visited, West Ford was his personal attendant. When John Augustine Washington’s widow Hannah died in 1802, she granted Ford his freedom at age 21. Bushrod Washington, George Washington’s nephew and heir to Mount Vernon, freed Ford in 1806, and Ford continued working for the Washington family. According to family oral history, Ford’s mother Venus told her mistress Hannah Washington that he was George Washington’s son. Nearly all historians doubt the claim, though one of Washington’s nephews certainly could have been the father. In 1812, West Ford married Priscella Bell, a free woman. Their four children—William, Daniel, Jane and Julia—were educated on the Mount Vernon Plantation, despite laws which restricted the instruction of African Americans. When Bushrod Washington died in 1829, he willed 160 acres of land adjacent to Mount Vernon to West Ford, who continued to live on the Mount Vernon estate. Over the next several years, West Ford was frequently highlighted in the media, making his private life a matter of public record. In 1850, two Virginia newspapers—the Alexandria Gazette and the Virginia Advertiser—carried articles describing his prestigious position and authority at Mount Vernon. In 1857, an entry in the Fairfax County Deed Books noted that Ford divided his land among his four children. In 1858, Ford was sketched a second time, this time by historian and artist Benson Lossing. In March 1859, Harper’s New Monthly Magazine published Lossing’s feature on Mount Vernon and included his sketch of Ford. Ford told the reporter of his property on Little Hunting Creek, where he planned to retire after the Washington estate was no longer in the Washington family. In June 1863, an ailing West Ford was brought back to the Mount Vernon estate by the Mount Vernon Ladies’ Association. The association cared for West Ford until his death on July 20, 1863. Foxing and show through, particularly near the signature. 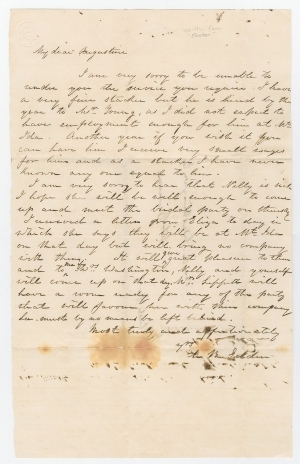 This reference may be to the wedding of Selden’s son, John D. Selden (1822-1896), to Anne Rebecca Kennedy (1825-1854) on June 19, 1845. They married at her father’s estate, “Cassilis,” near Charles Town and Harpers Ferry, (West) Virginia. Perhaps they traveled to Alexandria after the wedding. Likely Jane Charlotte Blackburn Washington (1786-1855), John Augustine Washington III’s mother. Probably Mary F. Alexander Lippitt (1804-1878), wife of Rev. Edward R. Lippitt (1798-1870). He was a professor of sacred literature at the Episcopal Seminary in Alexandria from 1825 to 1842, and he served as editor of the Southern Churchman from 1842 to 1848. Birthdates and other notes from “List of Negroes,” ca. 1845, in John Augustine Washington Farm Book, p. 106, Fred W. Smith National Library for the Study of George Washington, George Washington’s Mount Vernon, VA.